Back in early Februrary, Darren and I got an email out of the blue from biomechanics wizard and all all-round good guy John Hutchinson, saying that he’d obtained the neck of a baby giraffe — two weeks old at the time of death — and that if we wanted it, it was ours. And so it was that on Wednesday 9th March, I drove up from Ruardean to Potter’s Bar and picked up Darren and pterosaur-jockey John Conway from the railway station. From there, we found our way to the RVC campus easily enough, with only the statutory minimum number of times getting lost (once). But anyway, here is our baby, in left lateral view, as it came out of its plastic sack, measuring a healthy 51 cm in length. Like so many specimens, at this point it really looks like an undifferentiated blob of gloop. There are a couple of things to look for, though. On the left of the picture, you’ll see that the terminal 10% or so is well separated from the rest, ahead of of portion of exposed bone. That bone is the anterior margin of the axis (i.e. 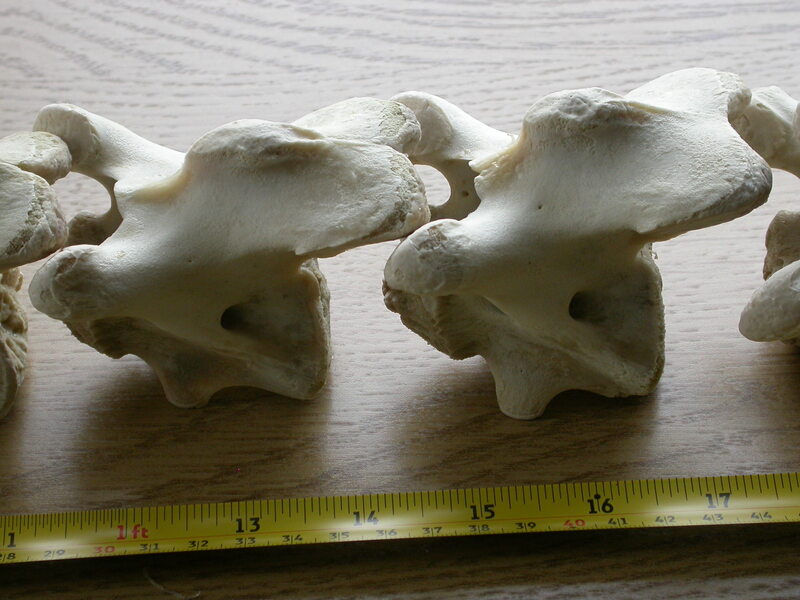 the second cervical vertebra). The atlas (first cervical) is still encased in soft tissue at this point, but could be moved around fairly freely, including twisting. On the right, and you’ll probably need to click through to see this, is a strange metal pin, stuck right into the back of C7. This was firmly embedded and we never figured out what it was, or what it was doing there. As you’ll see in the photos below, I’ve allowed it to stay in place, even in the final prepared vertebrae. If anyone knows what it is, do tell! I took a bunch of photos and measurements before we ploughed in, but I am ashamed to say that I failed to get many, many of the images and numbers that I should have. Even allowing for the fact that the specimen was not intact when we got it, we and particularly I fumbled the ball badly. So much so that I will shortly publish a tutorial on How To Dissect A Neck which will be based primarily on what we failed to do. I suppose it’s true that we only ever learn from mistakes. The trick is to learn from other people’s, rather than going through the frustrating and expensive process of making your own. Oh well. Next time, for sure. Here we have John (left) and Darren (right) hard at work teasing away the long epaxial muscles from their fascia. It was only after that process was complete that we thought to do one of the things we should have done up front — test the range of motion. We put the necks into poses of maximal extension, flexion and lateral deflection. Contrary to what I would have expected, the last of these was significantly more impressive than the other two, and is shown here. 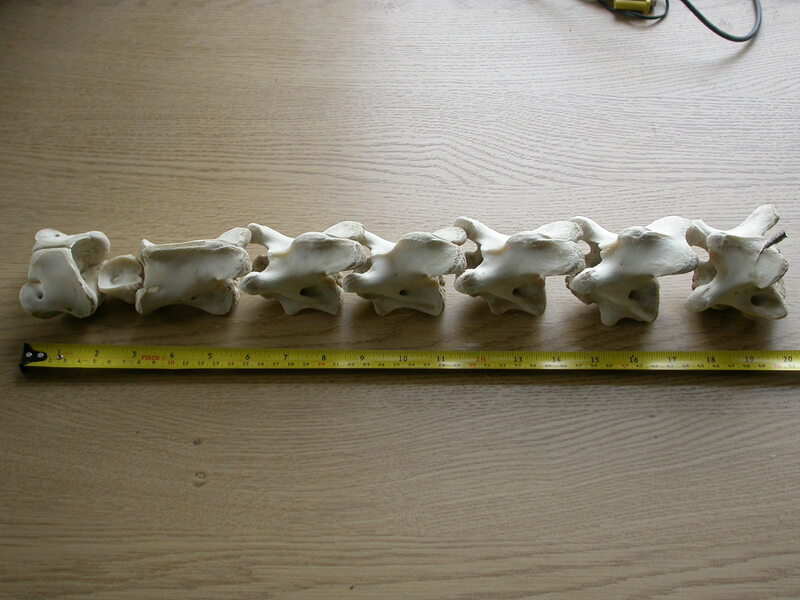 You can easily make out the separate extents of vertebrae 2, 3, 4 and 5, and from those see where 1, 6 and 7 are. We continued removing muscle and fascia until we had the vertebrae as close to naked as we could manage without risking damage to them, while retaining the integrity of the intervetebral joints — both intercentral and zygapophyseal articulations. One of the big surprises to us was how very flexible and fragile the latter were compared with the former. The membrane that contains the zygapophyseal joint is very thin and would contribute almost no mechanical strength of its own. By contrast, the adjacent centra were bonded very firmly together by extremely tough tissue. 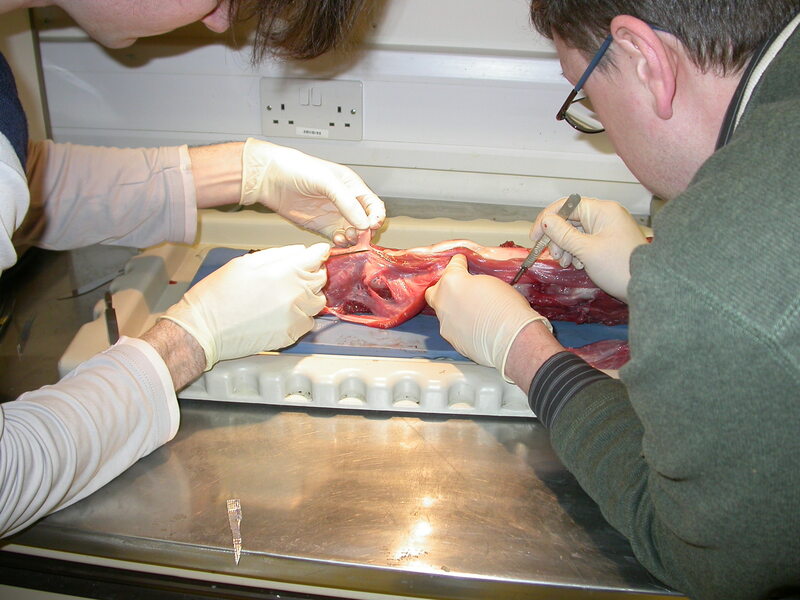 There was no trace of a separate cartilage disc between any pair of centra, just this very dense but flexible material which had to be slowly cut away with scalpels before the vertebrae could be be separated. And yet the axis was very firmly attached to the axis: although we couldn’t see any attachment, it wouldn’t come away — not even when a great deal of force was applied. The connection turned out to be between the ventral face of the odontoid process and the dorsal surface of the ventral portion of the atlas. (If you’re not familiar with anterior cervicals, this should become clearer later on when I show you the individual bones.) Suffice it for now to say that the atlas is basically ring-shaped, and that the odontoid process is a chunk of the axis that sticks out the front of that bone and sits within the O of the atlas. We did the best we could at detaching this ligament intact so that we could measure how compliant it is. It was difficult to remove without damaging, and much more irregular in shape than we’d expected, so that the anteriormost portion had almost no strength and broke as soon as we exerted any force on it. I am going to suggest that these necks [i.e. those of sauropods] were supported in the same way as the necks of horses, cattle, and their relatives. 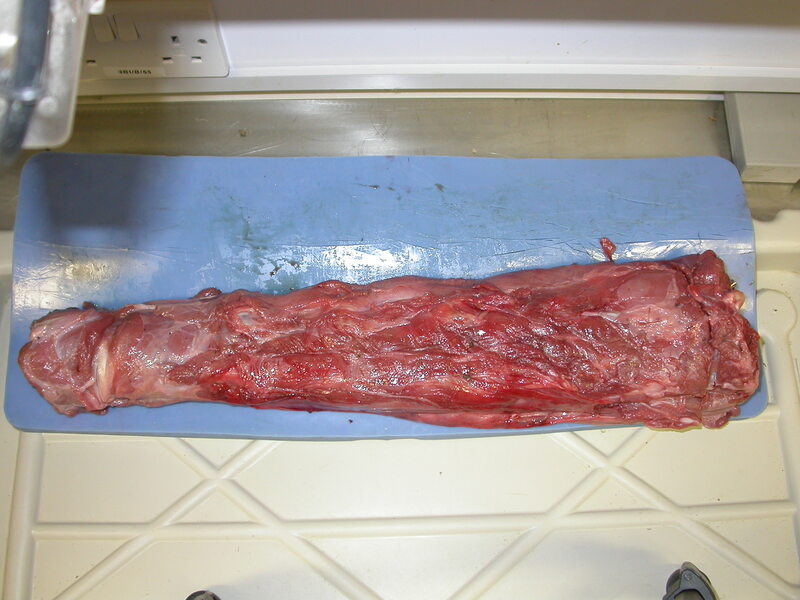 These animals have a thick ligament called the ligamentum nuchae running along the backs of their necks (figure 5.5). Unlike most other ligaments it consists mainly of the protein elastin, which has properties very like rubber. 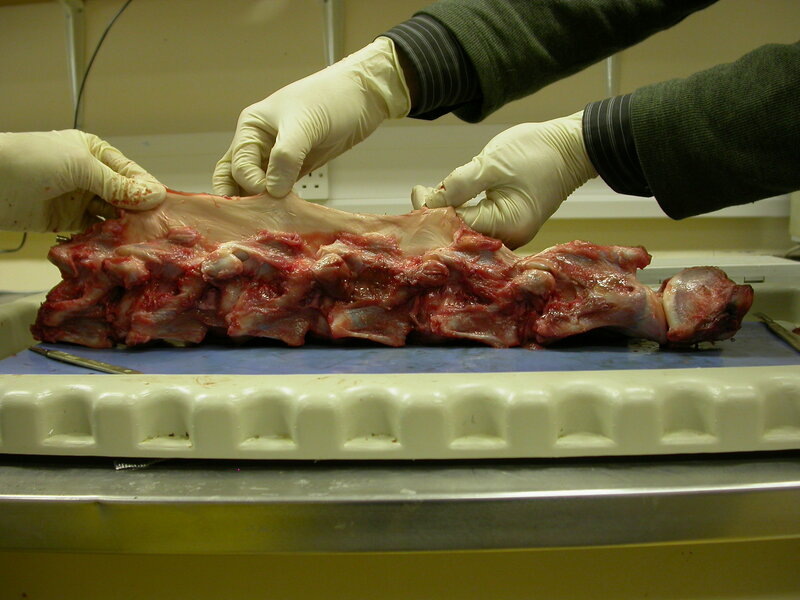 It can be stretched to double its initial length without breaking […] In experiments with deer carcasses, my colleagues and I found that the ligament was 1.4 times its slack length when the head was raised to the position of figure 5.5 [i.e. a typical alert posture], and almost twice its slack length when it was lowered to the position of figure 5.5b [grazing posture]. Notice that the ligament was stretched even when the head was high: I doubt whether a deer can get into a position that allows the ligament to shorten to the point of going slack. 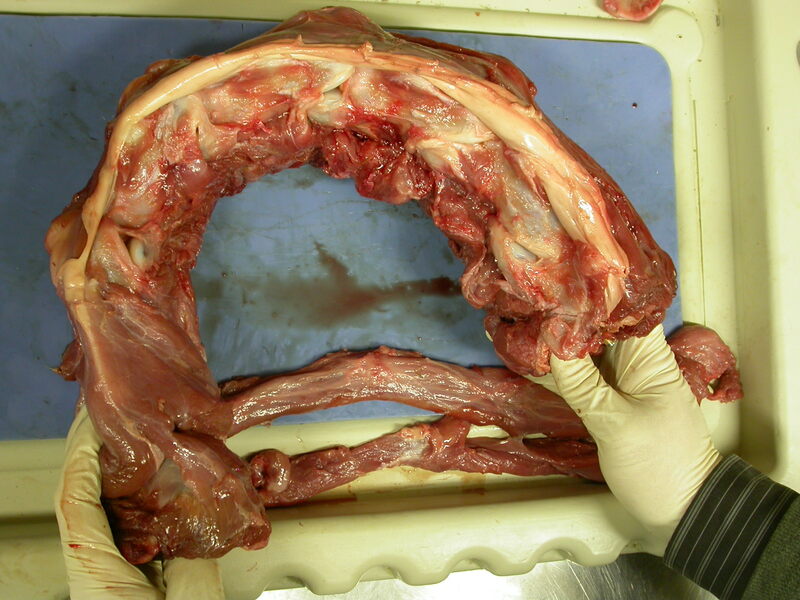 If you cut the ligament in a dissection the cut ends spring apart, as if you had cut a stretched rubber band. Alexander was talking a pile of poo. I don’t believe this for a moment, and mention it only for completeness. I am talking a pile of poo. I can see why you’d think so, but I know it ain’t so (and Darren and John can verify it). The composition of the nuchal ligament changes through ontogeny, becoming more elastic as the animal gets older: we had a baby, and Alexander had adults. I don’t think this is very likely either — I can’t see any reason why juveniles would need less elastic ligaments than adults. The composition of the giraffe nuchal ligament is different from that of the deer. Since I already eliminated the first three options, it won’t come as a great surprise to find that I favour the last one. And this has some interesting implications if it’s true. 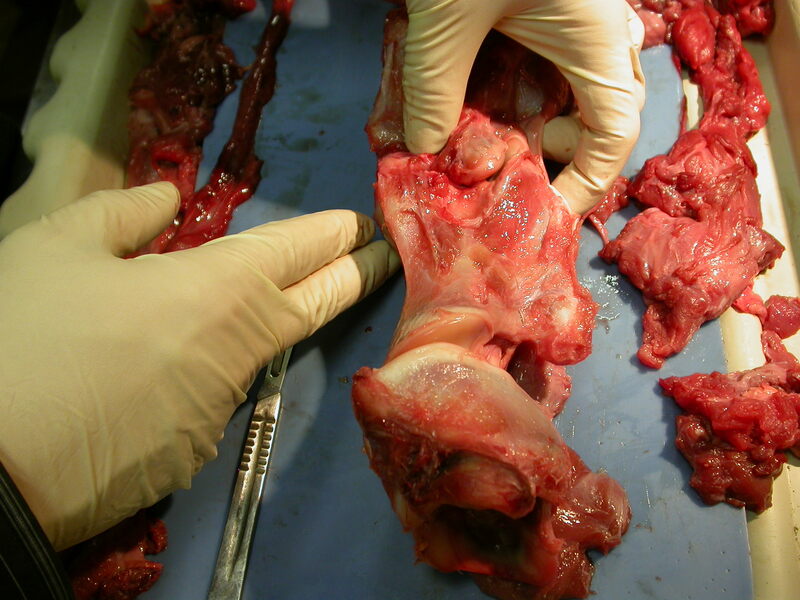 (Darn, darn, we should have saved a chunk of the ligament and found a way to get it analysed for composition.) If that nuchal ligament of giraffes is largely collagen rather than elastin, then it suggests the possibility of something similar for sauropods, and that would be interesting because the tensile strength of collagen is much greater than that of elastin. Does anyone know if anyone’s done any work on this? The disappointing part of this is that such large parts of the vertebrae turned out to be cartilage (partially ossified, I guess) and so came away during the simmering: huge chunks at the front and back of each centrum, like a full centimeter at each end, and all of the zygapophyseal articular surfaces. I wish I could have kept them intact … and of course a different preparation method probably would have done. More stupid still, I neglected to get photos of the individual vertebrae before simmering, which would at least have enabled me to show you before-and-after comparisons. Sorry. Note that the odontoid process of the axis is a separate bone from the rest of the axis — you can see it on the left, between atlas and axis. There was a big chunk of sculpted cartilage joining it to the rest of the atlas, and that’s all gone now, so I am not sure how I am going to join it up — maybe layer on layer of PVA representing the cartilage? Oh, and notice that the metal pin is still in C7. Needless to say, anyone trying to reconstruct the living animal from the bones alone — from fossils, say — would get a hopelessly wrong neck if they didn’t take the missing cartilage into effect. As we’ve noted before, the same is true of sauropod necks. But just how informative is a juvenile neck? No doubt, the cartilaginous portions of these vertebrae were proportionally much larger than they would be in an adult, so we do need to be careful about casually extrapolating the huge gaps between ossified centra in the images above into our interpretation of sauropods. For sure, I now need to go through this process with the neck of an adult giraffe — and if anyone happens to acquire one, I would love the opportunity to dissect it, please contact me if this comes up! But maybe it’s not quite so misleading as it looks — for two reasons. First, nearly all the sauropod specimens we have are from subadults, as shown by lack of fusion between scapula and coracoid in, for example, the Giraffatitan paralectotype HMN SII. So it may be that their vertebrae were also not fully ossified. And second, sauropods are more closely related to birds than to mammals, and in my limited experience bird necks seem to have a larger cartilaginous component than those of mammals. Well. Draw your own conclusions. But keep ’em qualitative for now. Next time, I’ll be presenting a tutorial on how to dissect a neck. But it will be based on what we should have done rather than what we actually did. 1. A juvenile deer of any sort (find a factory that processes veal and venison, go on — it’s England, I know you can) and 2. An adult deer of the same taxon. 3. Repeat the same experiment. You can also assess the differences in the material structure by performing histological studies. Affirm after me: Biomechanics is fun. Sure: add “juvenile deer” to my want-to-dissect list, along with “adult giraffe”. It doesn’t seem unlikely that this stuff is already covered somewhere in the extant-animal literature, though. Does anyone have references? IIRC, Jerry Harris did a big nuchal-ligament survey a few years back. Clearly, the metal pin is the control rod. Twist it to the left to make the giraffe veer to the left, pull back to accelerate..
Can I add a fifth option for why this nuchal ligament behaved in a way you didn’t expect? Perhaps freezing has altered the strength and/or elasticity. 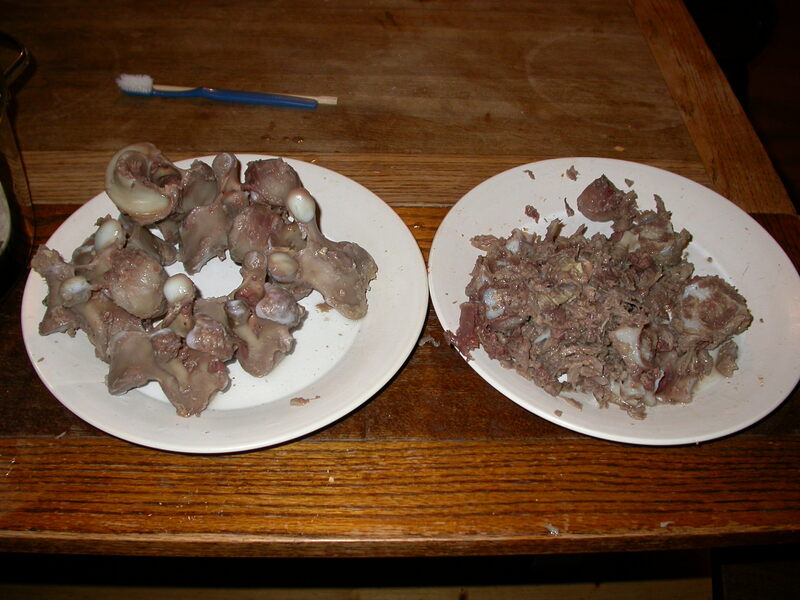 To add to Jaime’s experiment, you’ll also need to get a “fresh” giraffe neck and frozen deer necks. Dammit, Pete, now I need SEVEN more necks: juvenile and adult deer, fresh and frozen, adult giraffe, fresh and frozen, and fresh baby giraffe. Where am I going to get all those? Still, does it actually seem likely to you that an elastin ligament could change so dramatically in its physical properties by being frozen? I don’t like to declaim too vociferously in the absence of experimental evidence, but I wouldn’t have thought so — freezing and defrosting doesn’t have any similar effect on other organic tissues, does it? Could the metal pin have been the broken off shaft of a tranquilliser dart? We did wonder whether it could be a tranquiliser dart, in fact it’s still our least-bad hypothesis, but would you expect a dart to become embedded so firmly in a vertebra that it can’t be pulled out? Not a good approach to take if you want the animal to emerge from the experience unharmed, anyway. But maybe that’s how it was euthanised? We don’t know its history in any detail. I reckon the needle was banged in as a dissection marker before the neck was initially amputated but only after the skin had been removed in one piece to hang on someones wall! By the way, where you’ve written “dorsal surface of the ventral portion of the axis” I think it should say “….atlas”. What was the difference in length between the neck with its cartilage and the bones flush together??? Dean, your question is an excellent one. I answer it, with illustrations, in the next article. Do giraffes have cervical disc cushions? If they do, can they herniated? Also,what happens when they herniate? I can’t find this info anywhere… And thank you your page is fascinating and informative!